Another chapter closed. Another new beginning. This photo was taken two years ago. Hettie died on Friday afternoon. The vet said that in addition to the cancer, she had a few other serious problems. He gave us the option of coming back with her on another day, but as there was no hope of treatment or recovery, we decided to ease her pain straight away. She slipped away quietly while I held her. So after a lifetime of having dogs and cats around, we've decided that Hettie will be our last four-legged friend; it's too painful at the end. She was with us for a long time and it seems quite strange knowing she's not here now. RIP Hettie. Another chapter closed. Another new beginning. Our sincere thanks to everyone who sent us a message for Hettie. Your kind support helped us get through the sad hours and makes us feel loved. Thank you for taking the time to reach out. 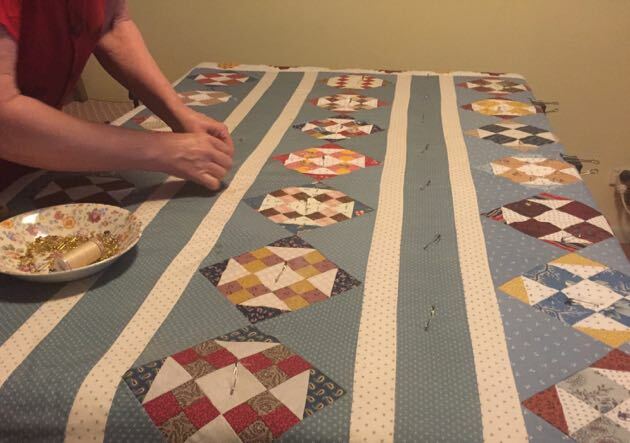 Tricia pinning her quilt before hand quilting. The weekend here was subdued. Kerry and Jamie called in so Kerry could help Hanno with some heavy work. They loaded the trailer twice and drove off to the local dump and then we had lunch together. Even after so much decluttering, there is still "stuff" surrounding us. Although to be fair, this was mostly from the shed and yard. It feels good to be getting rid of all that excess and rubbish. Tricia and I cleaned out the bush house and then she went inside to hand quilt while I stayed outside and did some repotting. I'm still working in the garden, planting, tying up, propagating and fertilising but I'll be ready to show you a few photos later in the week. Yesterday the three of us had lunch with Kerry and Jamie (Sunny was working) at a local pub which has its dining area overlooking the water. It did us all good to sit in the sun and relax. 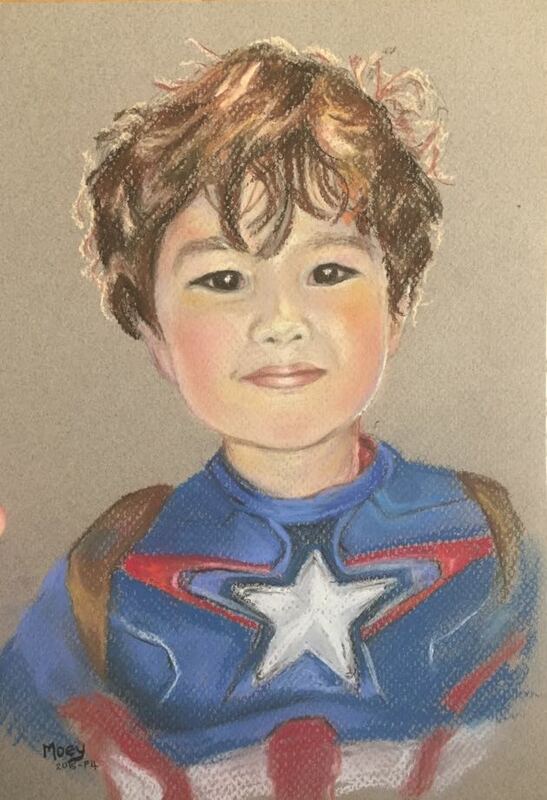 Receiving this pastel of Jamie was one of the highlights of my year. Moey is such a talented artist. She drew this from a photo on the blog, so it was a complete surprise to me. 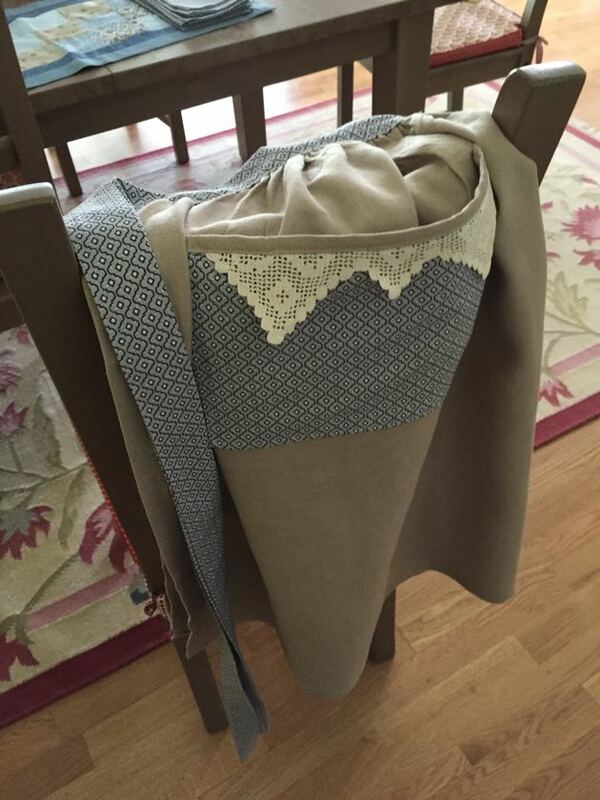 I've really enjoyed my sewing lately. 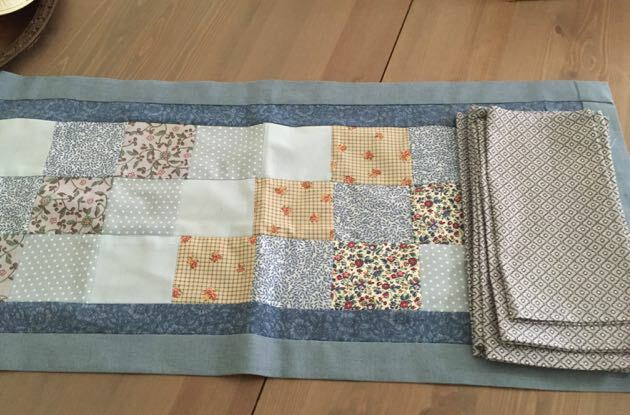 I took part in the Down to Earth Forum blue August swap, making a linen apron, a table runner and napkins for my partner Moey in Perth. She sent the pastel of Jamie above. Isn't it wonderful! And I found an old Mambo shirt hanging in the cupboard, it must be about 10 years old. I decided to repurpose it and made Kerry a big feather down cushion for his white leather lounge (photo above). He was away for his birthday so it became his birthday present. 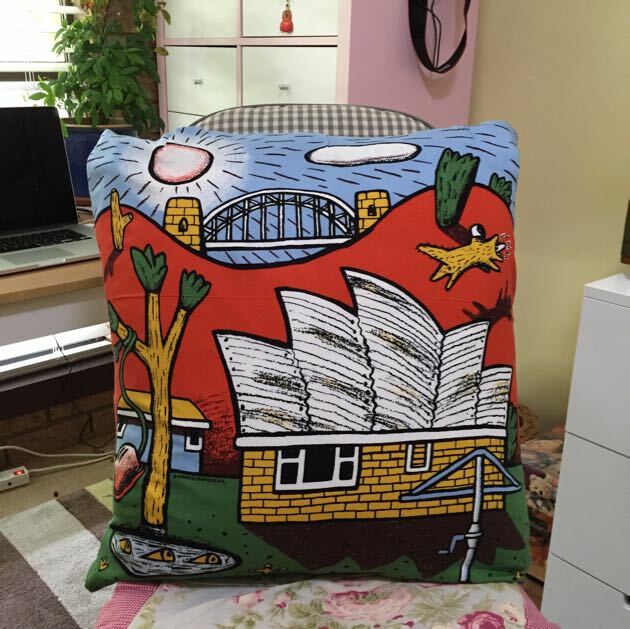 I think the distinctive artwork of Reg Mombassa needs to be on display, not hidden in a cupboard. The start of the blue quilt collection. Soon I'll be doing more work at the sewing machine. 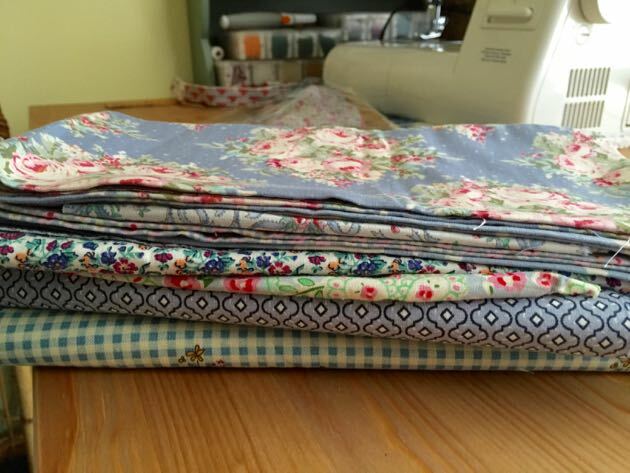 I'm planning (in my head) a blue patchwork quilt for our guest room. Now that I have more time to work in my home, I've decided to put some effort into a couple of areas so they reflect how we use those spaces. Homes change all the time and although I don't want to be constantly updating, it feels right to fluff up these spaces now, using fabric on hand, so we can all enjoy them and make guests feel at home here when they visit us. Ellymae bought my hardcover Down To Earth book from Amazon US so I've just checked out my Amazon page. It's available for sale there now but there are only 13 copies left. If you've been wanting to buy one for a while, the opportunity is there for you now. Click here to go to the page. 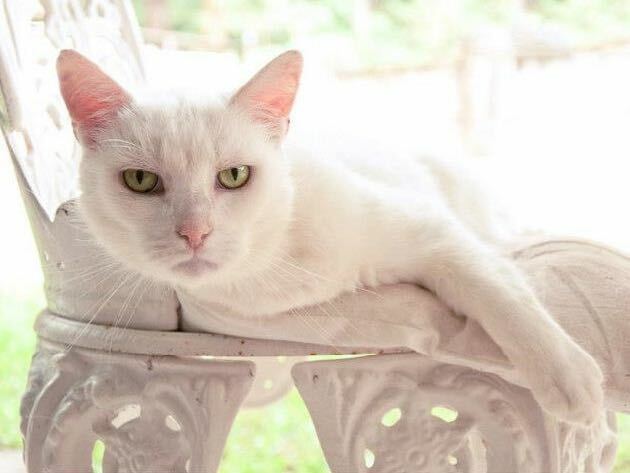 This is our much loved cat, Hettie. 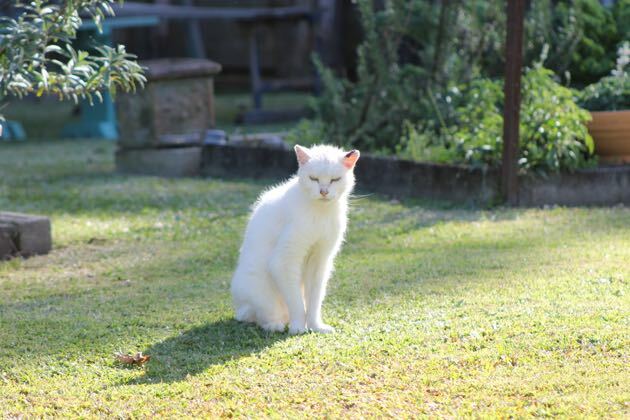 You can see in the photo she has developed skin cancer on her ear and nose, and she has arthritis in her front legs. Lately she's lost weight and energy. She'll be visiting the vet today and I doubt she'll return to us. Hettie is 18 years old and has lived her entire life here in our home and yard. ♥︎ I think it will be a sad weekend. Blood oranges are one of my favourite fruits although I usually forget about them because we grow our own oranges and by the time we've eaten and juiced our way through our trees, I'm over oranges for a few months. But then I'm reminded of these little beauties - they're perfect in our whole orange cake and if you make icing with the juice, it's pink. However, this recipe for rice pudding using the zest might be a good way to use one of the oranges you buy. You'll have to hurry though, the Australian season will be over soon. 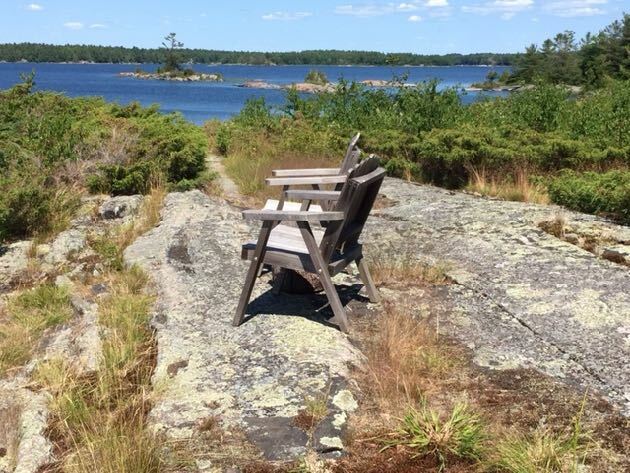 This is a weekly feature for readers to show us their favourite place at home. This week's photos are from Caroline in Ontario, Canada and Jan in Victoria, Australia. Thank you for the opportunity to share our special places! I really enjoyed the last time that you ran the photos and we could get a glimpse into the lives of other people and realize just how very different, yet alike we are. 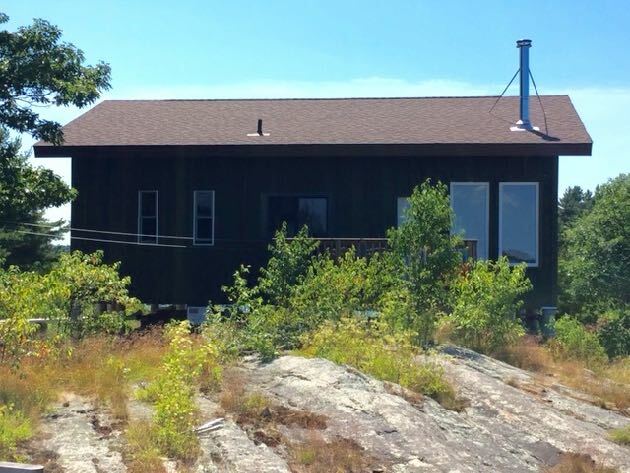 I live in Ontario, Canada and every summer for 10 weeks I live on an island out in Georgian Bay. When our children are older we hope to live here for half of each year. My inlaws bought the property back in the '60's, and 5 years ago my husband built our modest home here. We are completely off of the grid, and utilize solar panels and propane to power our daily lives. Life is simple and slower than back in the city and every year we work towards our goal of spending more time here. I enjoy numerous crafts, baking and spending time here with my family. Georgian Bay is a part of the Great Lakes and can be very temperamental weather wise. One needs to watch the weather carefully in order to plan trips to town for groceries! After September, we try to come for weekend visits, but after late October, it is much too cold and then time to get ready for another Canadian winter. Sometimes if the ice is thick enough in February, the family has snowshoed over to spend a chilly night or two with the woodstove going non-stop. I have recently begun blogging at www.offthegridneedlearts.com and would be pleased if you would visit. I have admired your writing for many years. My very clever husband built this out of our daughters old swing set. He's made self waterers and feeders out of polly pipe and they have a run out under our apple tree. 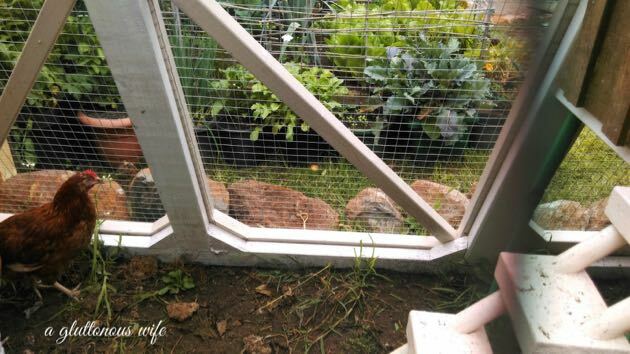 My 4 Isa Brown ladies (Fiona, Princess Penelope, Charlie and Nigella) look out over the vegie garden and are put out to free range when we can keep a watchful eye on them. We live in Southwest Victoria, near the coast and at the moment are in the midst of a wild winter. Our girls are held in the timber section of their house at night and I can access the eggs from the outside - you can possibly make out the little box on the left - it has a pull down hatch for ease of getting the eggs and cleaning. They have their roost in there and so far the cold hasn't stopped them laying 4 beautiful yellow eggs a day. 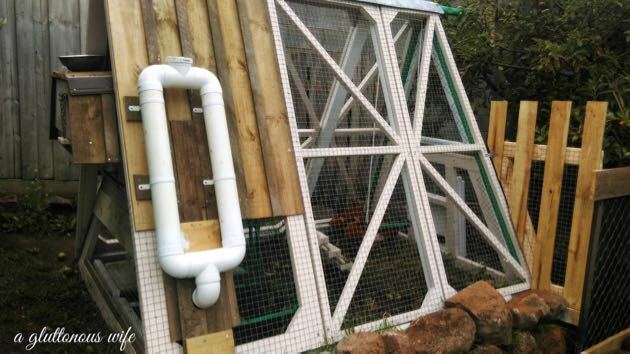 I just love this addition to our simple life, I never dreamed it would be such a wonderful thing but couldn't imagine my life without chooks now. Being able to collect eggs everyday is such a treat I'm not tiring of. They also provide me with a laugh at their characteristics and antics. When the weather is better, I sit out with a cuppa and watch them - it's strangely quite soothing and peaceful. 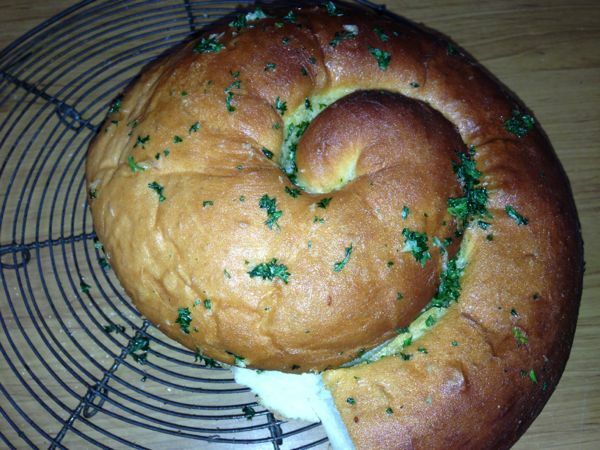 I've had a few requests to write about how I make bread. I've written a number of bread posts but as it's such a big part in our lives, let's go through it again. Even thought the bread I make looks like different recipes, I change the type of flour I use to get the variety I want but the recipe stays pretty much the same. I always use baker's flour, not pre mix. 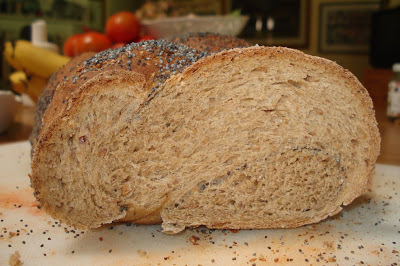 Over the years I've used plain white, wholemeal, whole grain, soy and linseed, corn and barley, leckerbrot and rye. 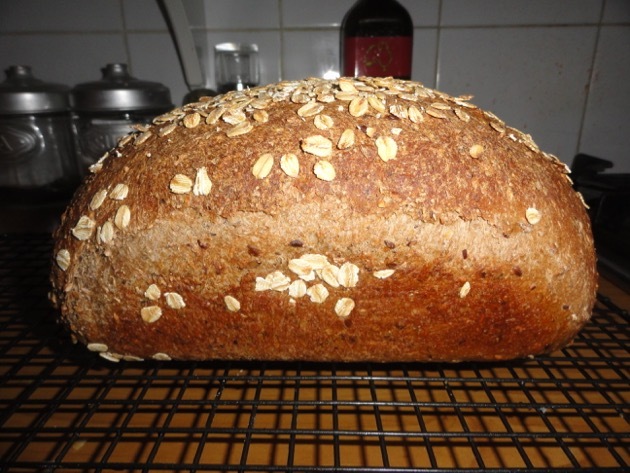 At the moment I have organic spelt, rye, white and wholemeal flours in the cupboard and it will eventually make up bread of different forms such as sandwich loaves, free-form loaves, bread rolls, baps and French loaves. Make sure the flour and yeast are fresh and if you want a more tender dough for to use for pizza, add a tablespoon of olive oil or butter. You can freeze the dough if you want to. It's often handy to have a few batches of dough big enough to make a pizza base in the freezer. 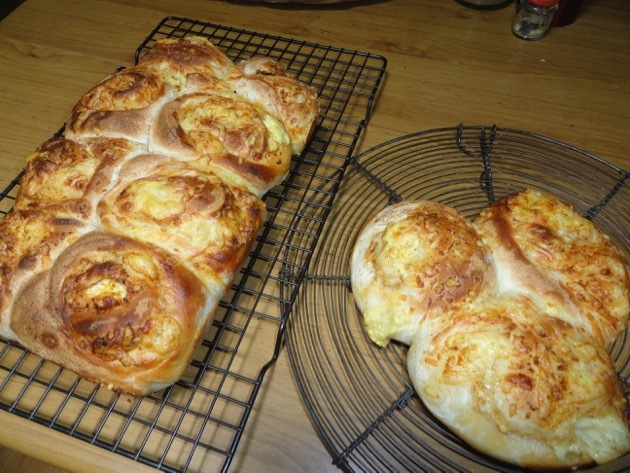 The following photos are all bread made using the recipe above but with different flour and toppings. If you're a new baker, don't give up if your bread isn't what you expect the first time you make it. 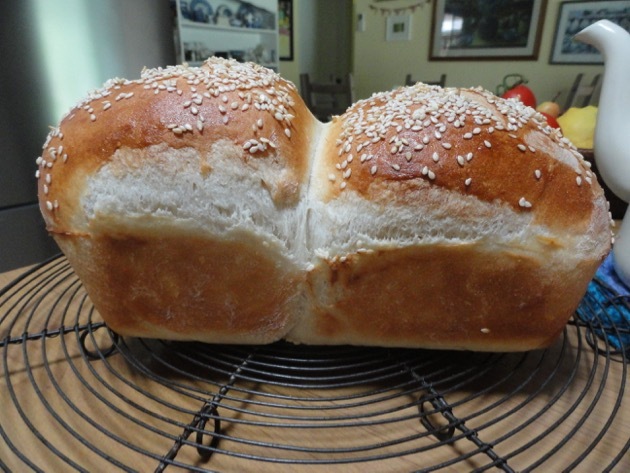 It took me ages to perfect a good dough, to know what to look for in the dough and to always get my hands in and feel it, even if it's being made in the bread maker. Teach yourself through trial and error what good dough feels and looks like and over the days and weeks, you'll teach yourself to produce loaves good enough to be used for sandwiches, rolls and toast. 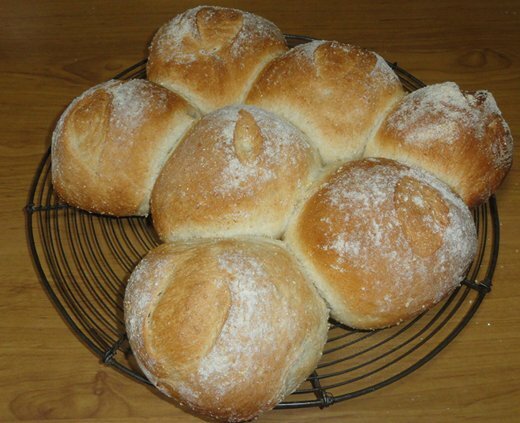 When you start producing good bread, experiment with toppings, additives and different shapes. 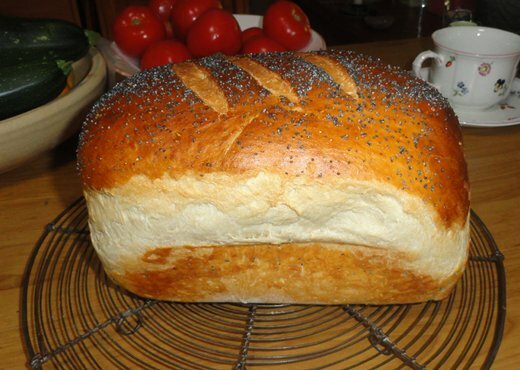 Remember the bread you bake will be made exactly to the dietary requirements of you and your family and nothing you can buy at the shops will be as good as what you bake at home. Your bread will be cheaper than the good bread you can buy (but not the cheap and nasty supermarket loaves), you'll know exactly what's in it and you'll have fresh bread in your home whenever you want it. I hope you try your hand at this because it's one of the core skills of a simple home. 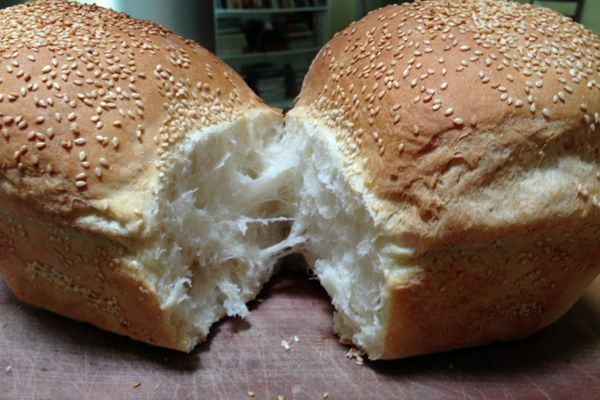 Even if it looks too difficult for you, trying and then perfecting a bread recipe will help you produce quality food in your own home and it will challenge you. And we all need that.